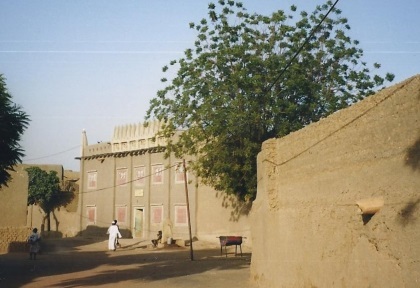 Djenn;e is situated on an island in the Bani-river, in central Mali. It was a prospering city from the 14th til the 16th century, when it acted as an important station on the Trans-Sahara route. In the 13th century, the ruler of that time built an enormous mosque of clay. That same building was still intact in the 19th century, after that it fell into decay. In the 20th century it was rebuilt. Every year, the mosque has to be replastered to prevent it from falling apart. This occurs in a festival-like event in Spring, and is carried out with help of many of the citizens of Djenné. Quite a lot of tourists visit Djenné, especially because of its famous mosque. However, the old two-storey houses in town are also very worth while. When you roam around the streets, the first thing that strikes you is the stench: the preservation of this worldheritage has reached so far that it is not allowed to construct modern sewerage. The UNESCO web site is even less informative about the inscribed elements of Djenne than it usually is and I have not even managed to access the “Advisory Body Evaluation”. The title is for the “Old TownS” (plural) but exactly what this includes is not made clear. The famous mud-covered mosque is clearly covered together with the extant surrounding townscape. Whether however the older town of Jenne-Jeno a few kilometres away, and now just an archaeological site, is included I don’t know for certain (though I am reasonably sure it is). 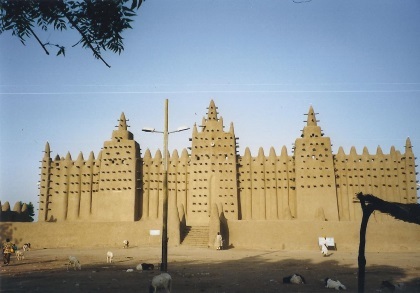 Yet this is the more important site historically and it is certainly not on Mali’s Tentative list as a separate entry. It’s most important period straddles AD400 – AD1300 after which the newly converted population moved the short distance to the new Islamic city of Djenne.. There is, in truth, not a lot to see at the archaeological site other than to gain an impression of its size, its walls and its many houses but, whilst you are in the area, it is worth the trip to see the site of what might well be the oldest city south of the Sahara. 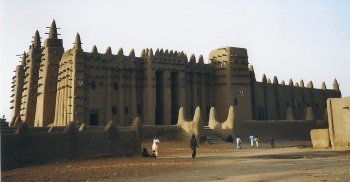 As for “modern” Djenne. If you go to Mali you are unlikely to miss it so there is no need really to “sell” it as a destination. The current mosque is in fact a relatively recent building (1905) but has become an African icon. It is very photogenic from many viewpoints – primarily from the main square and the houses which line it and allow tourists upstairs for a better view but also from more distant glimpses around the town (photo). As a tourist you will not be allowed into it however – “legend” has it that this is in response to the indecent cavortings of models during the production of a Pirelli calendar a few years ago (the Mosque in Timbuctoo can still be visited by non-Muslims). The town of Djenne is an island and there are some pleasant walks and views of locals going about their business to be had. The town’s main negative when we were there a few years ago is the surprising lack of a hotel of even reasonable quality and cleanliness considering the relative popularity of the town. Tell: From AB evaluation "The floods cover all but some hillocks; these are called toguere.....All these tells, which were a natural refuge from the flood waters, are potential archaeological sites and on that basis deserve to be protected." This refers to the Toguere of Djenne-Djeno and "Other toguere, such as at Hambarketolo, Tonomba and Kaniana..."
Historical Food Remains: The discovery of organic remains, among which were a large number of African rice grains, shed much light on how the cultivation of rice developed (AB evaluation). Discriminatory Entry Policies: Due to an unsavoury incident with an Italian fashion photography shoot, the great mosque is out of bounds for non-Muslim tourists.